The Phoenix Titan 24 will clean, wax and polish your floors to a wet look gloss. This is the only machine you need to maintain your floors on a daily basis. With it’s 24” size pad and sponge loaded, full contact pad drive, this machine can actually out clean many auto-scrubbers. 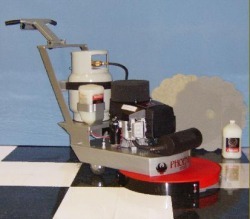 A low speed machine cleans better due to more pad pressure and the wet look shine is still achieved when the correct polishing pad and base coats of finish are used. The lower speed of these machines (1,000 r.p.m.) keeps dusting of floor finish to a bare minimum and reduces the need to recoat with floor finish.